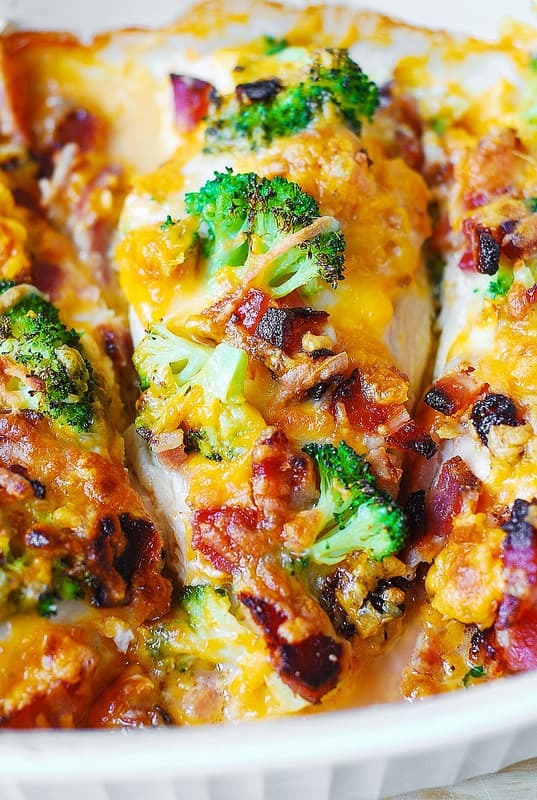 If you love chicken and bacon recipes (and who doesn’t? 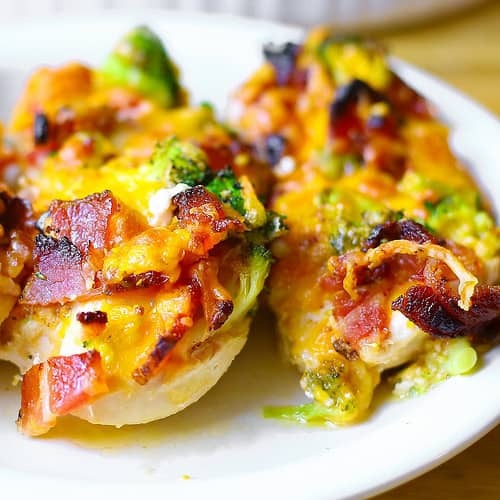 ), you will really enjoy this easy Broccoli Bacon Cheddar Chicken dinner. Just throw everything on top of chicken in casserole dish, and then bake in one pan for 30 minutes! Done! Low-carb, gluten-free, keto friendly chicken recipe. I’d like to note that there is nothing creative about this recipe. 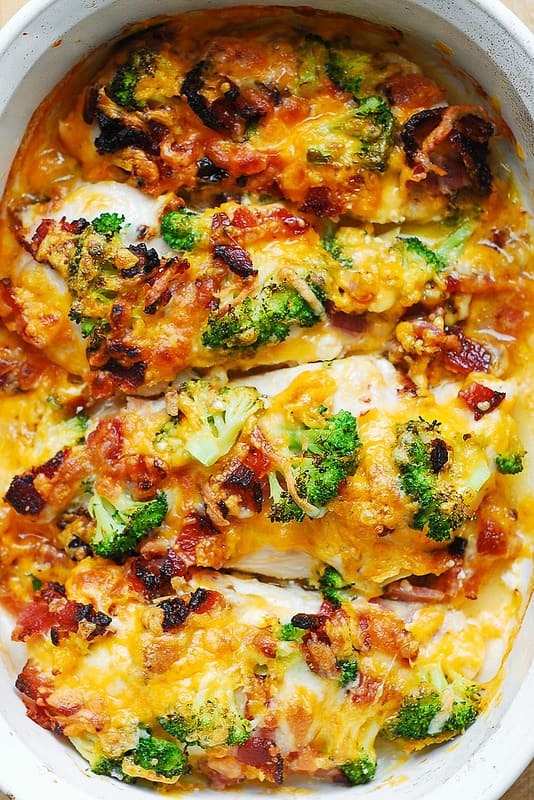 All the ingredients are very basic: chicken, broccoli, bacon, cheddar cheese. But the assembly and the cooking technique are so easy, which I hope makes this dish attractive to many, especially to those who love chicken and broccoli recipes. 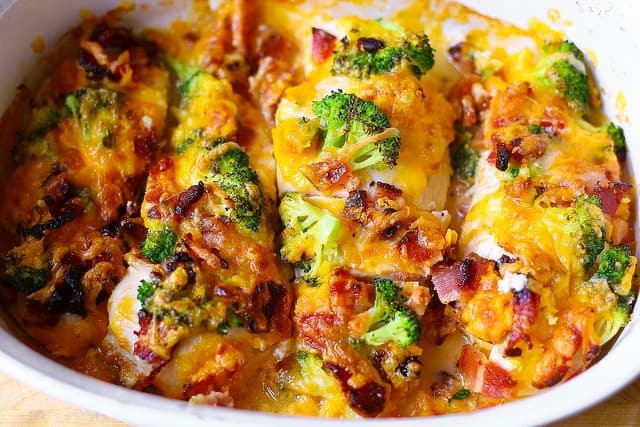 And, by the way, in terms of simplicity and the ingredients, this recipe is very similar to my ranch chicken bake and buffalo chicken bake with bacon. It’s all about making our dinners easy without sacrificing taste and our favorite ingredients. 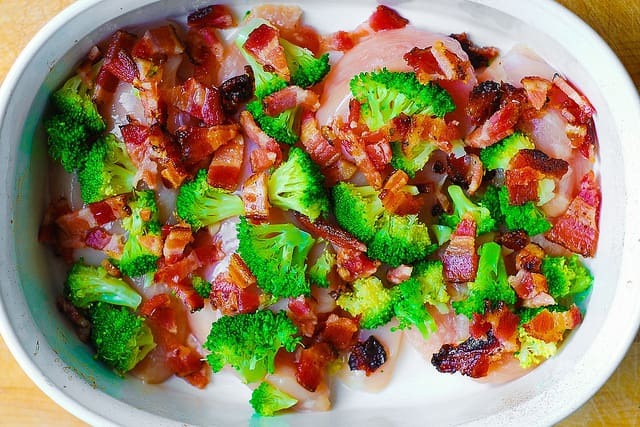 When you don’t have too much time on your hands and don’t want to think about what to cook for dinner – make this broccoli bacon chicken! 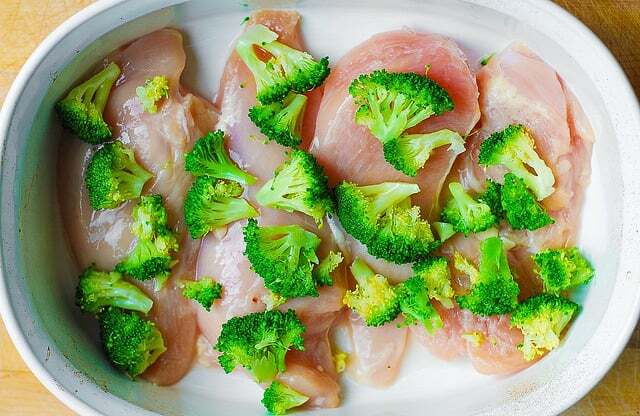 I recommend to blanch the broccoli before adding it on top of chicken (blanching means adding broccoli to boiling water just for a couple of minutes, removing it and draining it well). Blanching the broccoli makes it moist and brighter in color. 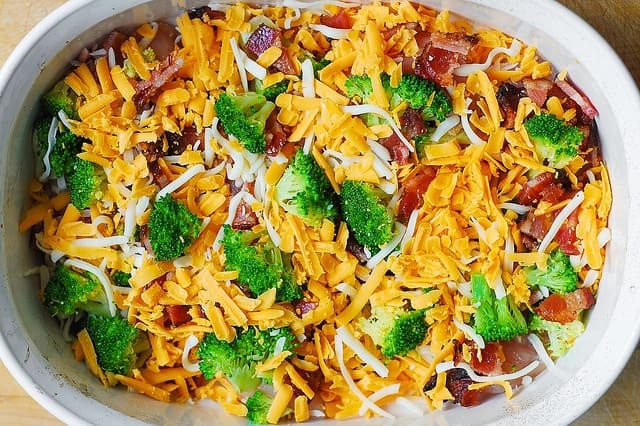 Bake your bacon broccoli chicken for about 30 minutes at 400 F in the preheated oven. 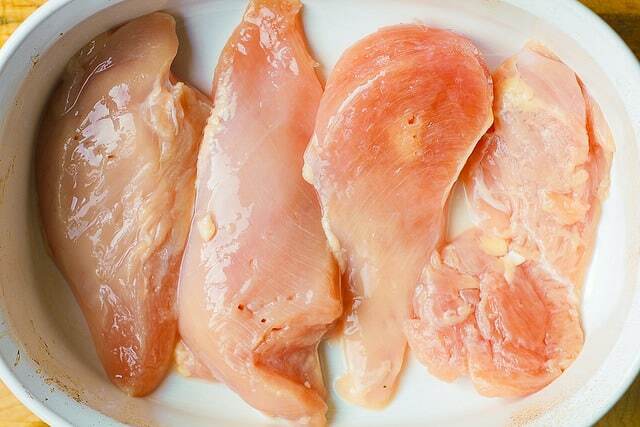 The exact baking time will depend on the thickness of your chicken breasts. 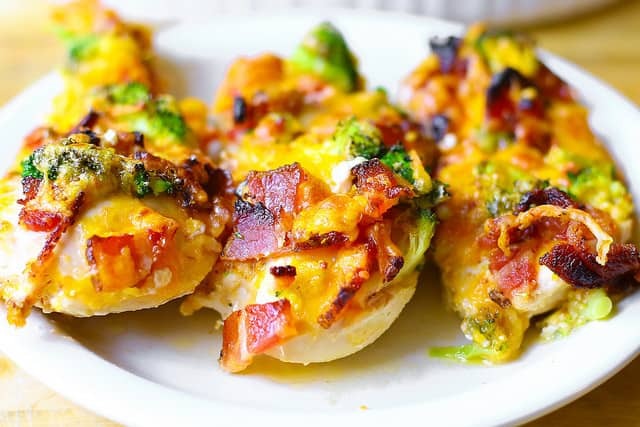 If you enjoy chicken and broccoli recipes, you'll love this easy Broccoli Bacon Cheddar Chicken dinner. All you do is throw chicken breasts in a casserole dish, then top with the rest of the ingredients and bake for 30 minutes! Low-carb, gluten-free, keto friendly chicken recipe. Top with chopped and blanched broccoli florets. Top with chopped cooked bacon. Running short on time and don’t have any thawed chicken. Do you think I can use canned chicken? This recipe is best if made with chicken breasts. Made this dish for me and my girlfriend, obviosly to apease ourselves we used a tad more bacon and cheese. Everything turned out amazing and was super easy to make! Just needed an extra few minutes to make sure all the cheese was melted enough and chicken was cooked to temp. So happy you liked this dish! Yes, it’s even better with more bacon and more cheese! Came out very well! I used a few extra chicken breast but still cut them as you instructed because I have a larger family. Luckily they weren’t too big as they still fit in the size dish you suggested. I also added herb seasoning for extra flavor. Very good meal overall! Thank you, Joy, for sharing your feedback! I am so glad you liked this recipe! 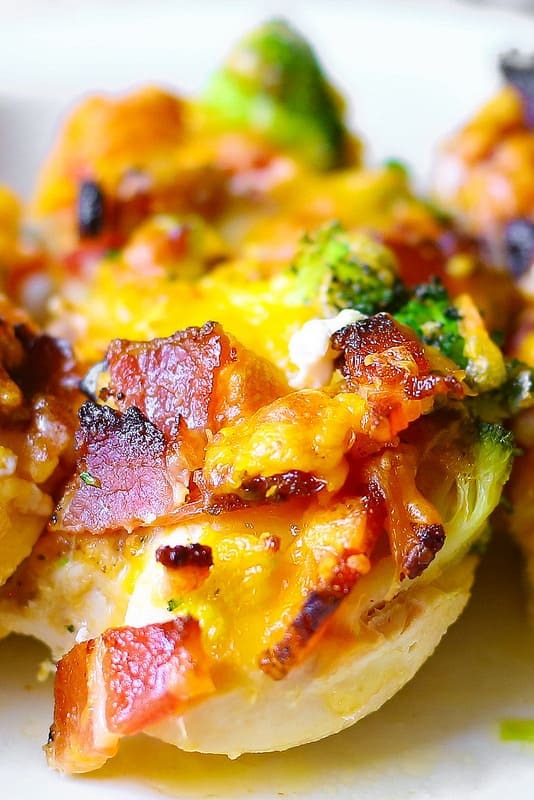 Very good recipe, my kids never eat broccoli but this time they eat all of it and they love it. I’m making this recipe for the third time. Definitely one of my Keto go to’s. So happy you’re making this recipe for the third time! Comments like yours make my day! 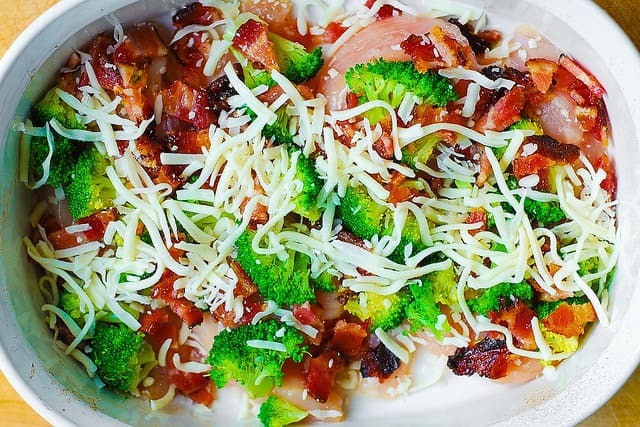 Yes, you can make this with fresh broccoli! Julia, this sounds tasty and I’m planning on making it for dinner tonight! Question, can I make this ahead and freeze it? I only have a large bag of chicken and planned on doubling the recipe. Since I have to thaw the chicken I was hoping I could bake it and then freeze it since I can’t refreeze raw chicken. If so, how would I go about reheating it? Yes, you can definitely freeze this dish after baking it. Freeze it in the air-tight container. Reheat it in the baking dish in the oven. 1 chicken breast (with its share of the toppings) is one serving. I tried this recipe tonight and it was a hit with the whole family!!! I love how easy it was, mine took a little longer to cook because my chicken breasts were thicker, but all in all it was easy and very delicious!! !